Providers participating in the National Surgical Quality Improvement Program say they see better outcomes when they take actions based on their data. In the winter of 1999, one ticking time bomb appeared to be the “Y2K bug,” when it was feared that computer glitches on Jan. 1, 2000, could cause any number of annoyances and even calamities. While that fizzled, another bomb—the Institute of Medicine report To Err is Human—soon exploded in the healthcare industry. The IOM report is still causing repercussions 10 years later. It was not the kind of event that later leads people to ask each other: “Where were you when you heard the news?” But Helen Haskell remembers when she first heard about the IOM report. She was in her car, listening to a news report on National Public Radio, and thinking it had little to do with her life. She recalls that moment now, a decade later, after losing her son to medical errors and helping to lead patient-safety advocates in their crusade for better care in hospitals. She founded the advocacy organization Mothers Against Medical Error. But what did it take to get to this point? The American Hospital Association, promoting its Prescriptions for Reform campaign that was launched in October, touts quality initiatives and improvements in organizational excellence that hospitals have made toward better and safer care. AHA President and CEO Richard Umbdenstock, among others, hails the IOM report as a “landmark” in healthcare. Prior to the light shed on quality shortfalls at hospitals, providers were able to dismiss errors and patient harm as other hospitals' concerns, not their own. “Ten years ago, we wouldn't have had this conversation, or we would have had it behind closed doors,” says Carolyn Clancy, director of the federal Agency for Healthcare Research and Quality, speaking at a recent Health Research & Educational Trust event commemorating the report. On Dec. 1, 1999, the IOM released findings that the industry was already generally aware of: Medical errors were leading to the deaths of patients who should have left hospitals healthy. The report, extrapolating information from two previous studies conducted in the 1980s and early 1990s, determined that up to 98,000 people died in U.S. hospitals each year because of medical harm. While that number is still used today as a basis of comparison for deaths, critics continue to question whether it was an accurate portrayal of problems in the industry, or useful in measuring how safe healthcare is today. Participants in the IOM report based their study primarily on research conducted in New York state and Colorado. The New York study included a chart review of hospitalizations in the state in 1984 by medical professionals, who screened 18 criteria to determine whether an adverse event occurred. The Colorado study similarly identified adverse events. But the studies represented “an incredible statistical extrapolation,” says Richard Anderson, a physician who is chairman and CEO of the Doctors Co., a physician-owned provider of malpractice insurance. In addition, researchers scrutinized the method of using medical-record review to estimate adverse events. For a report published in the Annals of Internal Medicine in 2002, they studied how reviewers' confidence and agreement on events were affected by the reliability and the effect of various criteria. The researchers concluded that medical-record review is “highly sensitive to the degree of consensus and confidence among reviewers” in establishing the presence of adverse events, according to the report. The IOM report provided a framework for that direction, says Janet Corrigan, president and CEO of the National Quality Forum, who helped to author the report. “We've now seen a decade of attention and initiatives,” says Corrigan, whose organization endorses evidence-based medical practices. Corrigan stands behind the numbers from the original report. The final estimation came from the only two large-scale studies of adverse events in healthcare, she says. And while the industry has made some strides in improving care, Corrigan says it has been slower than the authors would have liked to see after the release of their report. “We would have liked to make more rapid progress in the last decade,” she says. To Err is Human laid out the specific goal of reducing errors for the healthcare industry as well as recommendations on how to get there. In addition to reducing harm and mortality, the report called for a national error-reporting system, as well as private reporting systems through which providers could discuss mistakes and best practices for fixing them without fear of losing control of privileged information. The report also suggested that HHS create a patient-safety center, a role that AHRQ now serves. And the IOM recommended that hospitals develop cultures of safety, and work systematically to create standards to measure in-hospital injuries and hospital-acquired illnesses as well as financial incentives that reduce harm. At the five-year mark, researchers determined that meeting those goals was going to be a long-term challenge for the healthcare industry, according to a follow-up study by two of the IOM report authors, Lucian Leape, adjunct professor of health policy at the Harvard School of Public Health and a leader in the patient-safety movement, and Donald Berwick, president of the Institute for Healthcare Improvement. At the 10-year mark, the industry has just started to work with patient-safety organizations, the groups established through AHRQ that aim to protect safety data while allowing providers to discuss mistakes and problems freely. The agency also releases an annual safety study that measures hospital performance on several patient-safety indicators. In the past two years, progress on those indicators has remained flat, around 1%, according to AHRQ. 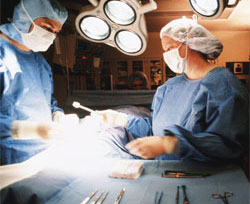 And the goal of eliminating various so-called “never events”—errors that patient-safety gurus say should never happen, such as wrong-site and wrong-patient surgeries—remains elusive, if the recent wrong-site surgery at Rhode Island Hospital is any indication. Doctors at the Providence hospital operated incorrectly on a patient's finger, representing the fifth wrong surgery at the hospital since 2007. The 635-bed hospital received a state fine for the most recent error and is installing cameras in its operating rooms to gauge performance going forward. Dan Ford understands the challenges that remain. In the early 1990s, his first wife became permanently brain-damaged after experiencing a morphine-induced respiratory arrest and a delay in receiving an intubation tube after a hysterectomy. That experience led him down the safety-advocacy path, to his current role with the group Consumers Advancing Patient Safety. He gives presentations to provider audiences about his experiences and sits on various safety committees. He is also vice president of Furst Group, a healthcare executive search business based in Rockford, Ill., and he consults with executives on safety issues. What's really changed since the IOM released its report is the attitude of leadership, Ford says. In the beginning, executives were “kind of ho-hum”; they thought problems might occur in other hospitals, never in their own, he says. But now CEOs are listening and realizing the importance of getting involved, asking front-line medical staff how to make changes and talking to families and patients. Listening is not enough, however, because errors and harm continue to occur, Ford adds. “We still don't know the depth of the problem because we still don't have a national reporting system,” he says. There is Hospital Compare, the CMS Web site that scores hospitals on patient satisfaction, processes and outcomes related to specific clinical conditions such as heart attack and pneumonia, but it does not track overall safety at facilities. Although the reporting has improved in the past 10 years, measuring that depth remains a challenge because it's hard to know what the starting point really was when the IOM released its report, Ford says. Even though a national reporting system hasn't been built yet, providers, states and some federal agencies have embarked on their own efforts to establish reporting systems and build databases of knowledge that can be shared. Where there has been success in establishing measurement of quality processes and outcomes, reporting shows that providers improve in the use of evidence-based standards and point to progress, according to Premier, a quality improvement and group purchasing network based in Charlotte, N.C. It has participated in several national pilot projects to measure quality and outcomes, and continues to develop its database of outcomes in various areas, such as hospital-acquired infections and other clinical conditions, and mortality. Premier's six-year-long Hospital Quality Incentive Demonstration project, which concluded this year and was conducted in partnership with the CMS, shows that providers focused on process improvement can bring about systematic improvement, says Susan DeVore, Premier's president and CEO. Premier's 1-year-old Quest project, borne out of the demonstration project and designed to study outcomes instead of processes, indicates that hospitals that have agreed to focus on 30 different measurements of harm can drive changes leading to improved outcomes and fewer deaths. The key is building that knowledge across an entire system, DeVore says. It takes about three to six years to determine root causes of problems and identify the best ways to fix those problems. But providers jump on improvement methods once they understand underlying causes. “More evidence needs to be built around clinical conditions,” she says. Progress on building evidence also has been slowed in the past by a lack of collaboration among hospitals, quality proponents say. But executives are beginning to see the benefit of sharing that evidence once it has been compiled, says Joan Evans, senior vice president and executive officer of VHA's Mountain States office, Denver. VHA also is a quality improvement and group purchasing network. Where at one time hospitals might not try to collaborate for fear of competitive disadvantages, they are now establishing collaborations and networking to determine which metrics should be used and how to share that data. “That was definitely part of a learning curve and building trust,” Evans says. VHA's Superior Performance Initiative, a collaborative effort among 34 members in its Mountain States region, collects data on metrics within six domains deemed critically important: patient safety, clinical quality, patient experience, community, finance and operations, and workforce. Participating hospitals identify the metrics and work together to improve performance as a region, Evans says. “The trust builds year after year. The results demonstrated it was worth sharing” one another's data and outcomes. Aside from just sharing data and reporting outcomes, providers must act on that data to see results. Research through the American College of Surgeons' National Surgical Quality Improvement Program, or NSQIP, shows that performing well on process measures does not immediately lead to better outcomes. “You have to focus on both,” says Clifford Ko, a physician who is director of the division of research and optimal patient care at the American College of Surgeons. The NSQIP was created out of a project by the U.S. Veterans Affairs Department, which in the 1990s wanted to reduce deaths attributable to hospital errors. After a four-year pilot earlier this decade funded by AHRQ to bring the research into the civilian sector, the project is open to all hospitals. More than 250 hospitals participate in the NSQIP, and there are collaborations among those hospitals, in which they agree to work together on certain factors and learn from one another, Ko says. In October, the country was shocked when the two pilots flying Northwest Airlines Flight 188 dropped out of radio contact for more than an hour and overshot their Minneapolis destination by about 150 miles before realizing their mistake. The plane landed safely; the pilots told authorities they had been distracted. Since the incident, federal and industry investigators have pored over the data to determine what happened, why and to ensure it can't happen again. The pilots subsequently lost their licenses. Such an incident is often called a “near-miss” in the airline industry. When the healthcare sector has reached a level of similar reliability so that all its errors and near-misses are known just as publicly, everyone can consider the safety culture to be on the right track, says Mark Chassin, a physician and president of the Joint Commission. The accreditation agency was named by the IOM in its report as one of the organizations best-positioned to help hospitals with quality and safety efforts. Meeting the goals of the IOM's report has been difficult because there is no one, overall measurement of “safe,” Chassin says. Safety is the absence of something bad happening, and “how do you measure things that could happen, but didn't?” he says. “We have a wealth of opportunities to improve,” Chassin says.